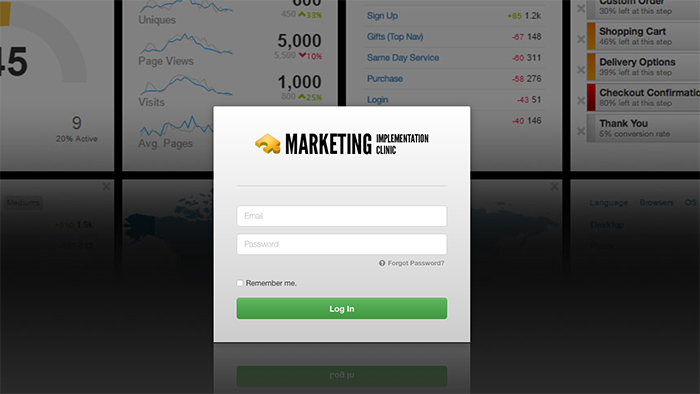 Type in your email address and password as supplied by Marketing Clinic. If you don't have a password click the "Forgot Password" link under the Password box and follow the prompts. To activate Chat, simply click the Chat Availability button on the top right side of the main navigation bar. This button allows you to toggle between "available" and "unavailable." When you're unavailable, the button will be grey. Gray indicates that chatting is inactive. This means your site's visitors will not see a chat box on the front end. When you're available, the button will be green. Green indicates that chatting is active. This means the chat box is visible on the front end of your site. When the chat box is visible, your visitors can request a chat with you. This is a great way to engage your visitors and help them through the conversion process. If you have any problems with the above please email support at support@marketingclinic.com.au.